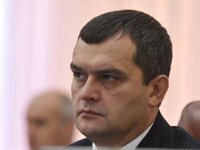 The Ukrainian Interior Ministry has obtained operative information about preparations by right-wing radicalized groups for a terror attack, Minister Vitaliy Zakharchenko said. "Right-wing radicalized groups are preparing to disturb the peace and they will stop at nothing, even a terror attack. This is proven by the operative information that we have and the latest events at the House of Unions, where an explosion has been staged. I do not rule out this happened while a bomb was being made," Zakharchenko said in an address posted on the ministry website on Friday morning. The ongoing negotiations between the authorities and the opposition have somewhat eased the tension, the minister said. Explosions have ceased and Molotov cocktails are no longer being thrown on Hrushevskoho Street in downtown Kyiv, but "some seem to dislike the lull," Zakharchenko said. The minister reminded the criminal plotters that the police were capable of finding and bringing them to justice. A bomb was found on Kyiv's Independence Square on Thursday morning. "A package bearing the legend 'drugs' contained an explosive device," Euromaidan activist Anatoliy Vedmid told a press conference. He said the bomb went off when the package was opened and tore off an opposition activist's wrist.